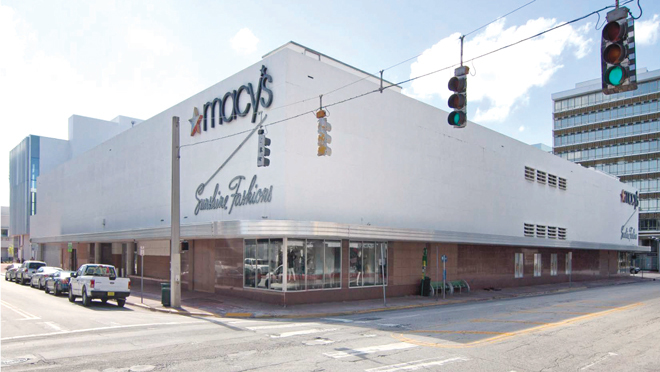 Sale of the Macy’s department store site on Miami Beach is currently in process. The site is under contract, with Marcus & Millichap commercial brokerage managing the sale. The Macy’s building itself at 1675 Meridian Ave. is a two-story square building that sits on 50,000 square feet, but the buyer has the option to expand development because a total of 137,000 square feet is available, with only 50,000 square feet currently being used. Details of who the buyer is and for what price have not been disclosed because official sale documents are still being processed. Macy’s still has a lease that was signed in 1951 and has about 33 years to run. In January, Macy’s announced that its historic building on Flagler Street in downtown Miami was closing as part of some nationwide planned store closures. While the downtown Miami location is in the process of closing, the Miami Beach location will continue to be open, according to Jacqueline King, manager for South media relations for Macy’s. In terms of how the site was marketed, Alex D’Alba, a senior Marcus & Millichap associate, said a database as well as networking were used to find clients. “We have a very vast database that mixes and combines institutional clients, as well as high net worth individuals, and that’s a database that has over 15,000 clients,” he said. “We market very specific clientele that we believe would have interest in this that would understand the land value in it. While Macy’s has a 99-year lease, Mr. D’Alba said long leases like this weren’t uncommon in the 1950s, especially when clients were large companies. Although the site is currently under contract, Mr. Alba said backup offers are still being taken.